Was this a good trade or a bad one? I'll let you decide. This is another example stock trade where I went against the trend of the market. That is what I like about being a discretionary swing trader. I can take advantage of opportunities that other traders might not take. Let me warn you. You really need to know what you are doing if you are going to attempt to trade against the market. But it certainly can be done if you can find stocks that have relative strength compared to the market. And this stock certainly had that going for it. 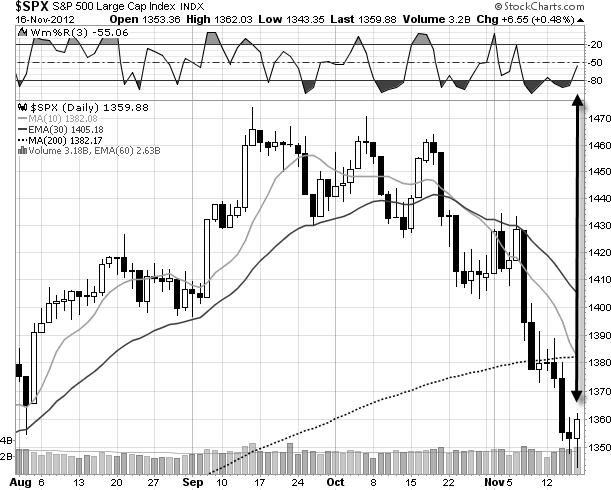 On November 16, the S&P was going into a correction. The 10 period moving average was below the 30 period moving average. Typically, we would look for short setups on a bounce. But, I wanted to play the bounce itself. 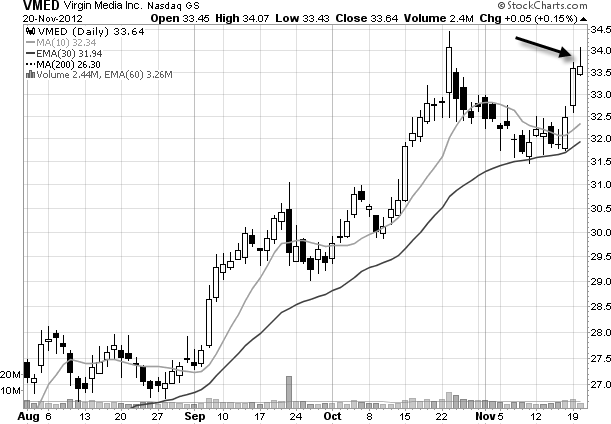 The market was very oversold and it printed a hammer candlestick pattern. 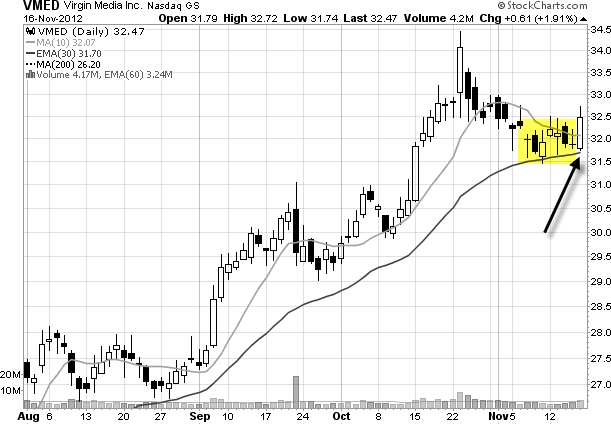 The only problem was to find a stock that had relative strength - a stock that wasn't affected by the market. Also, I was going out of town soon so I would have to be in and out without having to worry about any open positions. 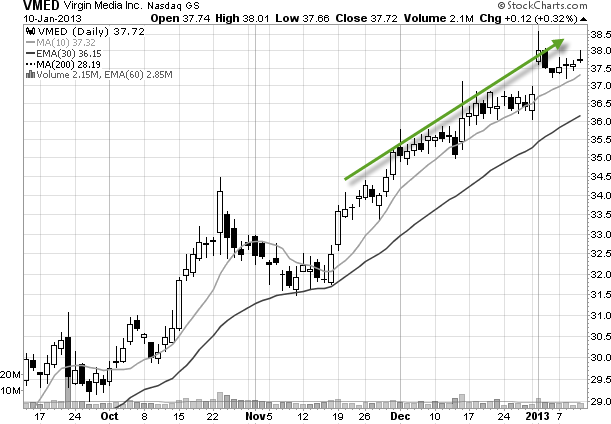 Virgin Media (VMED) was in a nice uptrend. It wasn't correcting like the rest of the market (it had relative strength). This is not a stock that I would typically trade. It's a pullback and a consolidation (highlighted) in one. The key to trading stocks that are moving sideways like this is to wait for the stock to make the highest close within the consolidation - without actually breaking out. You don't want to have to chase a breakout. 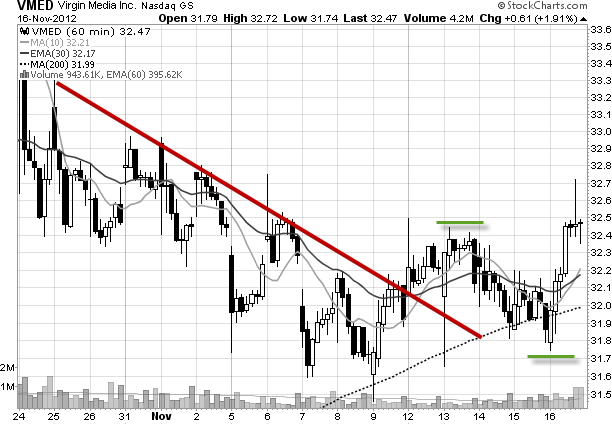 You want to be positioned in the stock before the breakout. Then you can sit back and watch other traders chase it! Nice. This stock has broken the downtrend (red) and is now making higher highs and higher lows (green). So, my expectations on the hourly chart confirm what the daily chart is showing. I bought the stock that day at $32.47. Kinda makes you sick doesn't it? So, even though I made a profit, this trade was my most disappointing swing trade of 2012. As a swing trader, you need big wins every now and then. This could have been one of those wins. never taken the trade in the first place knowing that you really didn't have the time to execute the trade properly? done exactly what I did and just been happy with the win? sold half your position and let the other half run? put in a stop loss order let the market take you out? It's easy to look back over previous trades and say, "I should have done this" or "I should have done that". But it's definitely not easy when you are up against the "hard right edge". One thing is certain. This swing trade will haunt me for a long time!